USE THESE POWERFUL STRATEGIES TO IMMEDIATELY ACHIEVE BETTER FOCUS, OVERCOME PROCRASTINATION AND DISTRACTION TODAY! Are you wasting your days and not being consistent in pursuing your dreams? Are you constantly getting distracted from your main goals? Have you ever let your circumstances stop you from achieving your goals and dreams? Are you successful in business and personal life? Would you like to feel strong and successful? If you answered "yes" to at least one of the above questions, then this book is just what you need to get informed, motivated, and take the steps necessary to get exactly what YOU want out of your life! Over this book your life will undergo an amazing transformation as you are about to implement the world's best execution strategy for driving radical results. STOP settling for things as they currently are and opt for progress and change. You will never achieve your highest potential or your dreams if you don't consistently make a conscious choice to step up and swing confidently at life's curveballs. DECIDE TODAY that no matter what problem arises in your life, you are always bigger than that problem. COMMIT to dealing with all your responsibilities and fears with everything you've got. From here on out for the rest of your life, refuse to shrink from anyone or anything. You are never as small or weak or helpless as you may think. You are a force of nature, a being of unlimited power and potential. CHOOSE to stand up in life. Make your presence known. Declare what you want. Be strong and fight for what you deserve. If you choose to strive for your best, for high performance in all you do and in all you ARE, then EVERYTHING changes. The struggle to the next level will be worth it. My aim is to introduce you to the change, challenge and work and prepare you for the great adventure you are about to undertake. 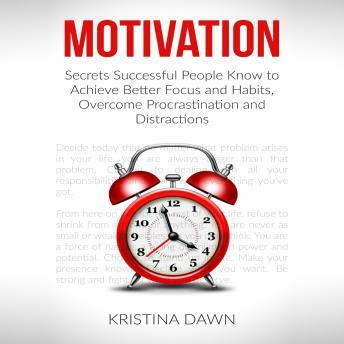 In this book I will give you some deep-dive motivation and high-performance strategies. How to stick to your goals and dreams? What does it take to gain good habits and how to maintain them? What are the main secrets to stay focused? How to break a procrastination cycle forever? Why getting fired from Apple was the best thing that happened to Steve Jobs? What are your standards in life and why do you need to change them?